When we start to feel the cold we put on extra layers - we wear jumpers and socks, and if it's really cold, we put on gloves and a beanie. We also make sure that our kids are warm and cover them up with extra layers of clothes - but what do we do for our pets? Many pets are just not suited to the cooler weather and like us, will be a lot more comfortable in a warm winter coat that can protect them from the elements. The WeatherBeeta Buddy Dog Coat is soft, warm and comfortable, and comes at a great price. It is made from a lightweight and breathable brushed cotton, and is perfect for milder days and for the indoors. Click here to view the WeatherBeeta Buddy Dog Coat. The WeatherBeeta Kennel Dog Coat is the ideal coat for great protection and great value. It is showerproof and features a strong outershell, coupled with a breathable, warm synthetic fleece lining, making it the perfect coat for moderate weather conditions. Click here to view the WeatherBeeta Kennel Dog Coat. The WeatherBeeta Fleece Dog Coat is fashionable, cosy and lightweight. It is designed to provide your dog with medium warmth and is the perfect coat for style and comfort in milder weather conditions. Click here to view the WeatherBeeta Fleece Dog Coat. The WeatherBeeta Landa Dog Coat is the ultimate coat for style, comfort and protection. It is very strong and fully waterproof with its breathable, ripstop outershell. It features a nylon lining with 220g of polyfill, which is sure to provide your dog with ultimate warmth. 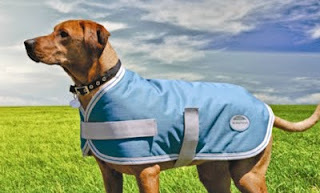 Click here to view the WeatherBeeta Landa Dog Coat. The WeatherBeeta Landa Lite Dog Coat has all the great features that make the Landa the ultimate dog coat but has been designed to perfectly suit dogs in milder weather. It is lightweight yet very strong and fully waterproof with its breathable, ripstop outershell. Click here to view the WeatherBeeta Landa Lite Dog Coat. Each dog coat in our WeatherBeeta range features a comfortable and adjustable touch tape chest and belly closure, which ensures that they sit securely on your dog. They are also all machine washable and come in a wide range of sizes, making them a great choice for dogs of all ages and breeds! Click here to view our new range of WeatherBeeta Dog Coats.